The Stone Harbor Motels are centrally located in downtown Stone Harbor, NJ. 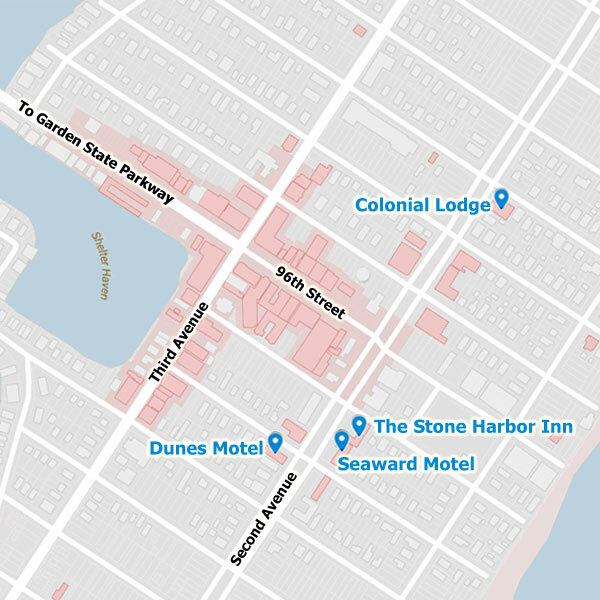 The four properties are located on Second Avenue: a short walk to Stone Harbor's beautiful beaches as well as shopping, dining, nightlife and wedding venues. FROM PHILADELPHIA: From the Walt Whitman bridge, proceed to the Atlantic City Expressway. Take exit 7S to the Garden State Parkway, to exit 10 toward Stone Harbor. FROM WILMINGTON: Delaware Memorial Bridge to Rte. 40 East, to Rte. 55 South, to Rte. 47 South, to Rte. 657 East (Stone Harbor Blvd.) to Stone Harbor. FROM EASTERN SHORE: Cape May-Lewes Ferry to Cape May, to Garden State Parkway North to Exit 10b to Rte. 657 East (Stone Harbor Blvd.) to Stone Harbor. Click Here for a MapQuest map of Stone Harbor and custom driving directions.